Crazily customized and Mazda-powered, today’s Nice Price or Crack Pipe Cortina obviously isn’t for everybody. Let’s see if its price ensures that it’s at least for somebody. To say that Porsche’s first mass-market mid-engine car, the 1969 - 1976 914, had unconventional, out of brand styling is like averring that Ben Carson should have gotten hold of an IKEA catalog. The point is pretty much out there. When Porsche decided to revisit the mid-engine milieu with the 718 Boxster and Cayman they stuck to their lane. The early Boxster even sharing its B-pillar forward with the contemporary 911 . Yesterday’s 2007 Porsche Cayman, the convertible Boxster’s coupé companion, proved that going with what works, well… works. That sassy styling, along with a $21,000 asking price more than made up for the car being the less aggressive base model. When all was said and done, it walked away with a 73-percent Nice Price win. I’d say it looked pretty good doing so too. Toys (Backwards R) Us, the biggest toy store chain in the U.S. is closing up shop. That’s a sad state of affairs. It also makes you wonder whether or not kids will now have to emulate the olden days and make their own toys. You know, stick and hoop sets, racers made from orange crates and old skates, and that kind of stuff. Do kids even play with real toys anymore? Or, do they just sit, staring sallow-eyed at little screens while their limbs atrophy and their brains turn into wilted lettuce? Back when I was a kid I had a ton of toys. A lot of them, like Tonka’s drump trucks and bulldozers might have even set a kid down a career path to a trade. Others, like the iconic Radio Flyer wagon, were kind of amorphous in their purpose, but boy were they fun. The Radio Flyer wagon debuted in 1930 and was named for two heroes of the day, radio engineer Guglielmo Marconi, and the aviation pioneer, Charles Lindbergh. The traditional red and white color scheme is almost as iconic as that of Coca Cola, although it should be noted that the wagons’ maker never once employed cocaine in their construction. 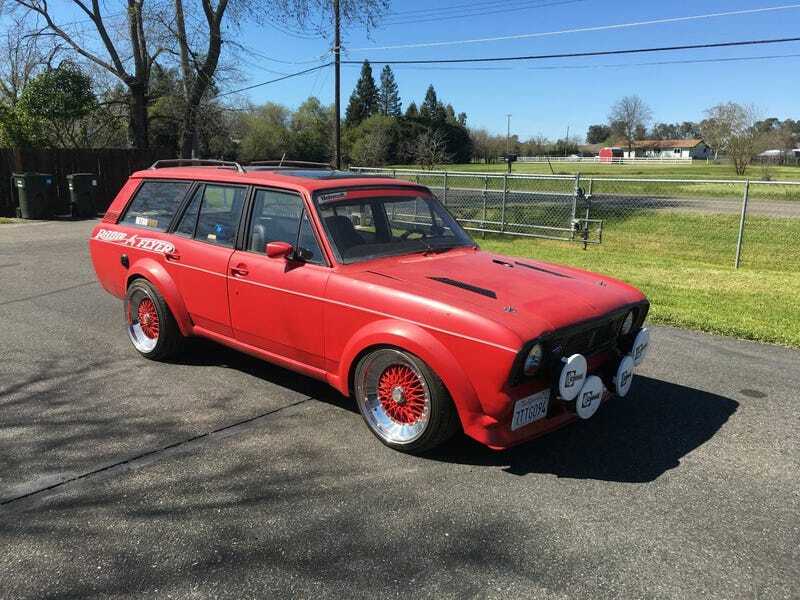 Here that color and toy wagon brand have been applied to a 1969 Ford Cortina wagon, and that, along with some other mods, might just make it the perfect toy for big boys and girls. The Cortina was long a mainstay of Ford of Britain’s lineup, but here in the States we only got it through two generations. Those ran from ’63 through ’70. The MKII Cortina, introduced in 1966, offered coupé, saloon and wagon body styles, all of which featured modest Coke bottle profile and a forward-leaning prow. Quality issues doomed the Cortina in the U.S., and in ’71 it was replaced here by the Pinto. This ’69 has been heavily Mad Maxed out. Under the bonnet the original Kent four has been replaced by a Mazda DOHC 1.6. That breathes through a turbo and is backed up with a five speed stick. There’s more Mazda under that too, as the ad claims the front suspension and brakes to be RX7 parts. Out back lives a Ford 8.8 inch rear end with Posi, so it’s not all Mazda under the petticoats. Okay, okay, calm down now, I know that’s all some heady spec right there, but keep in mind this is a work in process and it still needs some nuts turned to bring it up to snuff. The seller says that includes having the steering shaft lengthened, the rear shocks cobbled up, windshield wipers fixed, gas gauge… I don’t know, gauging. You get the picture. The bodywork is aggressively red and features fender flares on all four corners. Up top there’s not one, but two sunroofs, while down below deep dish red basketweave alloys underpin. The nose is resplendent in its full-on Cibe infestation, while out back the tail lamps have been replaced with units off of a trailer. It’s really an amazing amalgamation here. Inside there’s no carpet and the headliner has been replaced with what looks to be naughty pine. The seats look to be out of… um, I’m not sure, a Saab, maybe? The instrument panel has been denuded of factory gauges and is fronted by a wood rimmed wheel. Next to that, a center console of unknown origin swallows the shifter. Despite all the things done to the car it amazingly still has a clean title and seemingly current tags. Mileage? Who cares. What we are interested in however is the price. That’s $3,500 at which the seller says he’s taking a loss. Well boo-freaking-hoo. What we really want to know is whether this dogs breakfast of a Cortina is worth that kind of cash. 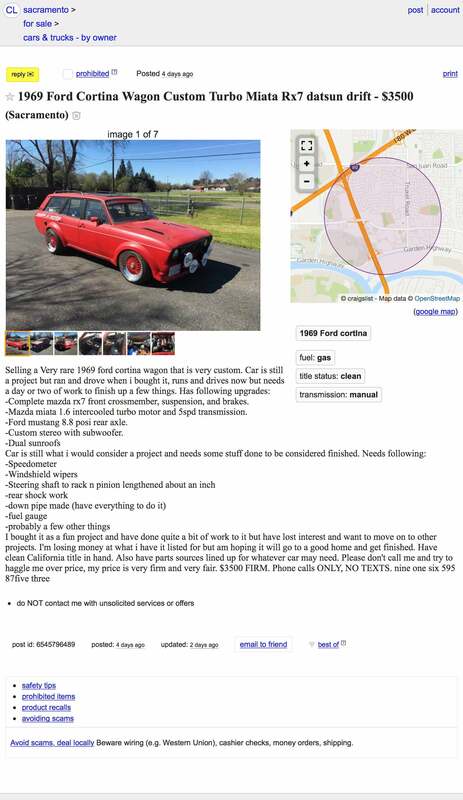 The seller says he’s lost interest in the car as a project, do you think it’s priced to generate any interest in anyone else?